Class of 1994 Air Force Academy graduate Col. Tim Cullen is one of six former student-athletes who will receive the NCAA Silver Anniversary Award this month, recognizing their collegiate and professional achievements. The Silver Anniversary Award annually recognizes distinguished individuals on the 25th anniversary of the conclusion of their college athletics careers. Representatives of NCAA member schools, conferences and past awardees select the recipients each year. Joining Cullen as 2019 Silver Anniversary honorees are Mia Hamm, David Hirsch, Lisa Leslie, Heath Shuler and Jason Varitek. The NCAA will recognize the recipients Jan. 23 at the Honors Celebration during the 2019 NCAA Convention in Orlando, Florida. Cullen is the fifth Falcon athlete to earn the honor and this season marks the second straight year, and third in the last four ,that an Air Force athlete has received the honor. Cullen joins former Air Force football players Chad Hennings, induction class of 2013 (USAFA class of 1988) and Dr. Chris Howard, class of 2016 (USAFA class of 1991), along with former baseball player Brig. Gen. Lance Pilch from last year (USAFA class of 1993) and Gen. Bob Beckel from the class of 1984 (USAFA class of 1959) as recipients. This year’s group recently reflected on their experience as college athletes, as told to NCAA staff. 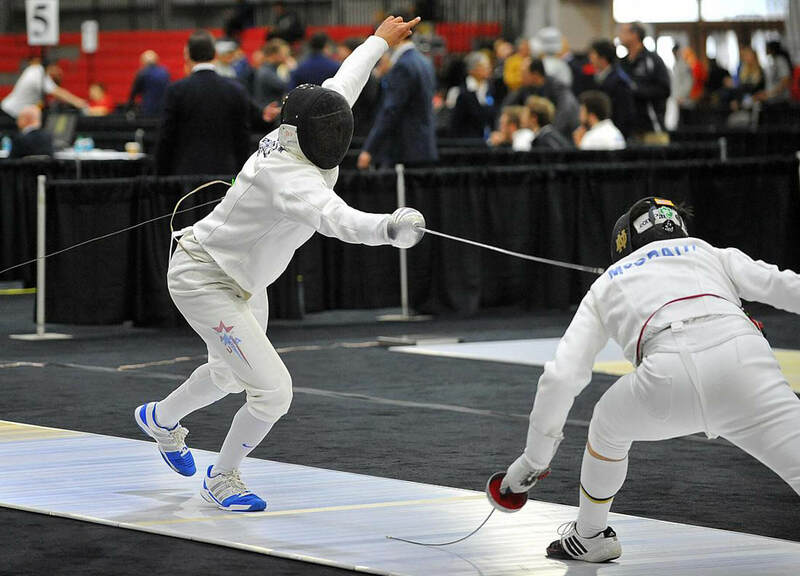 Tim Cullen, former fencing student-athlete at Air Force, was an NCAA All-American. The team captain led the Falcons to the 1994 West Regional championship. Also an Academic All-American, Cullen was a recipient of the 1994 NCAA Postgraduate Scholarship. A colonel in the Air Force, Cullen is currently commandant and dean of the School of Advanced Air and Space Studies at Air University on the Maxwell Air Force Base, Alabama. As commandant, he is responsible for creating warrior-scholars who have a superior ability to develop, evaluate and employ airpower as a component of military force in support of national objectives. Since graduating from Air Force in 1994, he has obtained a master’s degree in mechanical engineering from George Washington and a doctorate from MIT and has completed 23 years of active service. The fighter pilot also has completed more than 1,000 hours in the aircraft F-16C/CG/CJ/EG and over 250 combat hours. Additionally, Cullen is an FAA-certified flight instructor and a recipient of the Dr. John von Neumann Award for outstanding cadet in astronautical engineering. He is a member of the national engineering honor society, Tau Beta Pi, and the national aerospace engineering honor society, Sigma Gamma Tau. Over the years, he has coached youth sports such as basketball and soccer. Cullen has served as the board president of Maxwell Elementary and Middle School since 2015. “I come from a small town in Wisconsin, with little to no background in our family in military service and no background in fencing. I didn’t even know much about the Air Force, the military or fencing when I arrived as an Air Force Academy cadet in the summer of 1990. With great coaching and great teammates and the support of the community, they were able to develop me to such a high level that I could become an All-American. On top of that, I was able to learn how to employ the F-16 in combat. “This award reinforces the importance, for me, of how blessed I am — blessed to be associated with a great group of people and blessed to be shown what is possible. Without that success and without great teammates and the coaches, I wouldn’t have taken as many risks in life as I might have otherwise, because having confidence that you can start from nothing — no experience whatsoever — and perform at a very high level is a powerful feeling. Mia Hamm played on the U.S. Women’s National Team from 1987 to 2004, becoming the youngest player to ever play for the team at the age of 15. Hamm played soccer for four years at North Carolina, leading her team to four NCAA championships before her graduation in 1994. Hamm led the nation in scoring in the 1990, 1992 and 1993 seasons. In 1992, she set the NCAA single-season scoring record with 97 points. By the end of her final season with the Tar Heels, she had set the national career scoring record with 278 points on 103 goals and 72 assists. Hamm was a two-time National College Player of the Year and a two-time Atlantic Coast Conference Female Athlete of the Year. She also was named the NCAA tournament Most Outstanding Player on offense in 1992 and 1993. She was named one of the top three female soccer players in the 20th century by FIFA and was one of just two women’s soccer players to be named to FIFA’s list of the 125 Greatest Living Soccer Players in 2004. Hamm was the first woman inductee into the World Football Hall of Fame in 2013. She was named the U.S. Soccer Female Athlete of the Year for five straight years from 1994 to 1998. The two-time Olympic champion and two-time World Cup champion ended her international career as the world’s leading scorer in women’s soccer with 158 goals, a mark that lasted until 2013. Hamm actively raises funds for several children’s hospitals, including UNC Hospitals. She established the Mia Hamm Foundation in 1994 to raise money for bone marrow transplant patients and their families. “My time at North Carolina made me the player and person I am today. I graduated from high school, and two days later my parents left for Italy for six years. My parents weren’t coming to watch my games. My dad got to a couple national championship weekends, but they couldn’t see me play regularly. I was on my own. If I had a bad week, I couldn’t just drive to my parents’ house and unload and re-energize. He gave me an avenue to be a little vulnerable. He taught me it’s OK to have those feelings of doubt and uncertainty, but also to know we’re here, we’re a team, we’re a family. Everyone talks about creating environments for people to succeed, but they created an environment for us to fail, as well — to build up that grit and that resiliency. Dr. David Hirsch, former wrestling student-athlete at Cornell, was the 1994 NCAA Division I wrestling champion at 126 pounds. He became the first Cornell student-athlete since 1960 and just the fifth in school history to win a national wrestling crown. Hirsch was a three-time Eastern Intercollegiate Wrestling Association champion and a two-time All-American during his time at Cornell from 1990-1994. His record of 116-17 ranked third in career wins at Cornell at the time. Following his athletic career, he served as an assistant wrestling coach at Cornell for the 1994-1995 season, helping lead the team to an Ivy League title and fourth place at the EIWA Championship. Hirsch graduated from New York University College of Dentistry in 1999 and then completed medical school, wrapping up a six-year oral and maxillofacial surgery residency at Bellevue/NYU. Today, Hirsch is chief of the Division of Oral and Maxillofacial Surgery/General Surgery, Department of Otolaryngology, Head and Neck Surgery at Lenox Hill Hospital in New York. His private practice, Manhattan Maxillofacial Surgery, is nationally respected. Hirsch is a jaw surgery pioneer in the United States. A team of surgeons at NYU Langone Medical Center, led by Hirsch, performed a cutting-edge jaw surgery on a patient with a fast-growing tumor called ameloblastoma. The surgery involved removing the tumor, rebuilding the jaw bone, and dental implants — the first operation of its kind in the country. He also is a medical advisory board member for NexGen Face, an organization that provides pro bono work around the world to correct cranial and facial syndromes and birth defects. Throughout his professional career, Hirsch has traveled internationally for philanthropic purposes, performing surgeries ranging from correction of genetic deformities to major head and neck reconstruction. “To me, doing well by people but also doing the procedure that’s cutting edge and exciting, I get the same rush that I did when I succeeded athletically. The same butterflies I used to get prior to participating in a sporting event, I still get those if I’m going to do a very complicated procedure. I think I thrive in those types of pressure situations, and that’s kind of what has allowed me to be successful. When things get tough or there’s adversity, I feel like I tend to do well. And when I’m done with that, I feel like I grow from those situations. Sport: Women’s BasketballLisa Leslie, former Southern California women’s basketball student-athlete, was a three-time All-American. While at Southern California, she tallied 2,414 career points and 1,214 career rebounds, making her the program’s No. 3 all-time scorer and No. 4 all-time rebounder. She holds Southern California’s shot-blocking record with 321. Leslie was the unanimous 1994 National Player of the Year. After completing her eligibility and degree in communication, Leslie moved on to play professionally in the WNBA for 12 seasons with the Los Angeles Sparks. While with the Sparks, she won two WNBA team titles and was named a first-team All-WNBA performer eight times. She is the WNBA’s No. 3 all-time leader in rebounds with 3,307 and is No. 2 in blocks with 822. She ranks sixth all-time in scoring. Leslie also led Team USA to four Olympic gold medals in 1996, 2000, 2004 and 2008. In 2015, she was inducted into the Naismith Memorial Basketball Hall of Fame. In January 2018, she began her role as a studio analyst for the Orlando Magic on Fox Sports Florida and is a contributing analyst for CBS Sports. The Naismith Memorial Basketball Hall of Fame and the Women’s Basketball Coaches Association named the inaugural award given to the top centers in Division I women’s basketball the Lisa Leslie Award. She has become an advocate for cancer awareness, beginning as a spokesperson for the National Alliance of Breast Cancer Organizations. She has actively raised money and awareness for the Kay Yow Foundation for cancer research. She is the co-creator of Empowered — an online community of women aiming to help young female entrepreneurs succeed through mentorship, guidance and coaching. “The first class I took at Southern California was a summer course before my freshman year called, simply, “time management” — it has shaped my life, helping me recognize the importance of proper preparation. Since then, I have achieved success by planning ahead, staying organized and mapping out my goals, both short- and long-term. I’m so thankful to that Franklin Planner I used in college! Although my iPhone has taken its place, my calendar, alarms and to-do list are still the keys to my success. Whether it’s having a successful marriage by making time for date night, organizing my never-ending “mommy to-do list,” or balancing my five-job career — real estate associate, Fox Sports analyst, CBS Sports co-host, public speaker and coach — I am grateful for that time management class I took back in college. Sport: FootballHeath Shuler started at quarterback for Tennessee in 1992 and 1993. After passing for a Southeastern Conference-best 2,354 yards and 25 touchdowns, he was the runner-up for the Heisman Trophy in 1993. That season, he led the Volunteers to a 10-2 record and a spot in the Citrus Bowl. The same year, he was named the SEC Player of the Year and earned All-SEC first-team honors. Shuler ranks fifth in Tennessee history with 36 touchdown passes and 10th in all-time passing yards with 4,088. After Tennessee, he spent four years in the NFL with the Washington Redskins and New Orleans Saints. After retiring from the NFL, Shuler returned to Tennessee to complete his degree in psychology and went on to pursue a successful real estate career in Knoxville. His real estate company remains one of the largest in East Tennessee. Shuler moved on to a career in government, serving as a Democratic member of the United States House of Representatives from North Carolina. He served for three terms from North Carolina’s 11th Congressional District from 2007 to 2013. The primary sponsor of two bills, Shuler served on the Budget Committee and the Committee on Transportation and Infrastructure for the House of Representatives from 2011 to 2012. Additionally, he has volunteered regularly with local community organizations and has also served as a youth football coach. “David Cutcliffe — he was my position coach and offensive coordinator at Tennessee, he’s now the head coach at Duke — would always talk about having a plan. So, for example, if we were in the middle of the game and the defense was not what we wanted on a particular play, he would say, “Heath, you have to have a plan.” Whether it be changing plays or calling a timeout, you have to utilize your vision and the information you’re given and have a plan. What’s most important is that I’ve utilized that lesson in life. Jason Varitek, former baseball student-athlete at Georgia Tech, was a three-time first-team All-American. In 1991, he was named Atlantic Coast Conference Rookie of the Year. During the 1993 season, he led the ACC in hitting at .404 and in home runs with 22. That same year, Varitek was named the ACC Player of the Year. In 1994, he helped his team to the College World Series, where Georgia Tech finished as runner-up. He was the recipient of the 1994 Golden Spikes Award, given to the most outstanding amateur player in the nation. He holds numerous Georgia Tech program records, leading in most career games played (253), career runs scored (261), career base hits (351), career home runs (57) and career RBIs (251), among others. He went on to play 15 seasons with the Boston Red Sox. During his professional career, he was a two-time World Series champion and a three-time American League All-Star. In 2005, he nabbed both the Rawlings Gold Glove Award and the Silver Slugger Award. Among a host of community outreach endeavors, one of his largest charity events is the Tek & Friends Charity Golf Classic, which benefits Pitching in for Kids. Pitching in for Kids is a nonprofit organization that provides grants designed to improve the lives of children across New England. After retiring from his playing career, he served as a special assistant to the general manager for the Red Sox and is now the special assistant to the team’s president of baseball operations. “Whether you were a great student growing up or not, you had to become a great student to make it at Georgia Tech. There are no cutting corners. You’re going to get out of it what you put into it. They are going to demand that from you. I remember one of my management classes, we had a professor named Philip Adler, who would call me out every single day I was there and made me answer a question. And that’s just the way Tech is. “My experience was unbelievable. The academics there are second to none. The baseball program was top-notch. The people, the educators, the coaches — coach Jim Morris and his staff and later on coach Danny Hall and his staff — it was just great.